The ProForm Pro 2000 Treadmill is ON SALE! Price Alert: This is $200 OFF the Regular Price of the SMART Pro 2000! The best selling ProForm Pro 2000 treadmill is built by Icon Fitness, which also builds NordicTrack treadmills. It’s a great machine loaded with features, yet sells for a relatively low price. The company excels in giving you the best value for your money. In fact, in their recent ratings a leading consumer magazine gave the ProForm Pro 2000 a “Best Buy” rating. It was rated “Excellent” for ergonomics and exercise range, which is impressive. Other machines in this line include the ProForm SMART Pro 9000 with a 10″ Smart HD Touchscreen and the SMART Pro 5000 with a 7″ Smart HD Touchscreen. MID-WEEK SALE ENDS THURSDAY: The ProForm SMART Pro 2000 is priced at $1,399. This is $200 OFF the Regular Price of the SMART Pro 2000! The ProForm Pro 2000 is designed for walkers, joggers and runners, although we would suggest that fanatical runners consider upgrading to the SMART Pro 5000 or SMART Pro 9000 model with their 4.0 CHP motors. You will find that when selling for $1,299, the Pro 2000 generally will out specs the competition in regards to the major components. It also is iFit Live Ready, which offers some very innovative features designed to motivate you to achieve your fitness goals. In particular, we like the fact that you can incline and decline the ProForm Pro 2000 deck from -3% to 15%, giving you the sensation that you are running up and down hills. It also offers the benefit of targeting additional lower body muscles. What’s Up with the NEW SMART Pro 2000 vs the Original Pro 2000? This season, ProForm has decided to add a new and “improved” version of the Pro 2000 with some update features. For this new SMART version, it now comes with a 1-year FREE iFit membership, 7″ SMART HD Touchscreen, and 50 on-board workouts. Luckily, they didn’t pull this trick with the SMART Pro 2000. It looks like all of the features above are positive things. 3.5 Continuous Duty HP Motor — This is a larger motor than you will find on other treadmills at this price range. It will run effortlessly during your workouts, even at higher speeds or with heavier individuals. ProForm designs their motors to run cooler and to use less energy than the competition. 7″ HD SMART Touchscreen – This display will allow you to monitor your fitness stats while you’re exercising. It also lets you view your iFit programming. A very nice feature to have on this machine. Bluetooth compatible heart rate monitor – This machine works with various brands of heart rate monitors and a wireless chest strap is even included with your purchase. This type of heart monitoring is more accurate than hand grips and will help you better analyze your workout and achieve the best results. Declines and Inclines — The ProForm Pro 2000 treadmill has a deck that both inclines to heart racing 15% and declines to 3%. This allows you to simulate running up and down hills, and lets you target additional lower body muscles. 22″ x 60″ Running Surface — When we were out to visit the company they made it a point to tell us that the 60″ is the actual running surface. They mentioned that other companies advertising a 60″ treadbelt may have a running surface as much as 4″ shorter because part of the belt is covered by shrouds. This is an excellent length for speed and interval training. The 22″ width is impressive for this price range. The belt is only a 1-ply belt instead of a 2-ply belt used by other machines. This is one sacrifice for the price. iFit Live on a ProForm PRO 2000 – A separate smart device will be needed to view your virtual routes. Sync with Google Maps: In addition, through Google Maps, you can simulate exercising on trails and roadways throughout the world. With the use of a smart device that you can place on the console, you can define a route on Google Maps, and your treadmill will simulate the terrain by adjusting the incline or decline. In addition, you can see a street, satellite, or earth view as you run the route. There is also a library of existing routes through famous city-scapes or national parks. We tried it when we were at their corporate headquarters and were able to virtually run down our local streets 2000 miles away. Virtual Competitions: With iFit Live you can also compete in sponsored races. There are a series of scheduled races through predetermined routes. As you race you can view your progress in relation to the leader and the pack. One of their recent race had 2,000 competitors. Things to Know about iFit on the Pro 2000: The main downer for this program is that iFit Live does require an additional subscription cost. Fitness tracking programs from some of the competition offer similar features for free. This machine is listed as iFit Ready. This means the Bluetooth capability is already built into the machine. You will just need to link a smart device like your smart phone or tablet in order to view your virtual running routes. If you’d rather view the running route directly on your treadmill, check out the HD Smart Touchscreens on the ProForm Pro 9000 or Pro 5000 models. The ProForm SMART Pro 2000 comes with a 1-year FREE membership so you can try out the iFit features before paying a subscription fee. 32 Installed Workout Programs — If you don’t want to spend the money for iFit Live the ProForm Pro 2000 treadmill has a generous selection of workout programs that let you choose from high intensity, speed, incline or calorie-burn workout routines. The programs control the speed and incline of the treadmill. Service Coverage — The ProForm Pro 2000 comes with a lifetime frame/motor, five year parts and two year labor warranty. 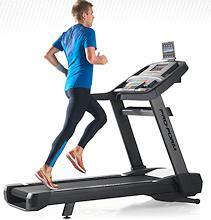 Most treadmills in this price range come with 3 year parts and 1 year labor coverage. Speaker System with iPod/MP3 Player — You get two 3″ high-excursion drivers (speakers) that have impressive sound clarity considering they are built into a treadmill console. You can plug in your iPod or MP3 player and rock out as you burn off those calories. Check out our Comparison Chart of all ProForm Treadmill models here. ProForm Pro 9000 – This machine has a stronger 4.0 motor and a 10″ HD Smart Touchscreen. – Read our full review here. 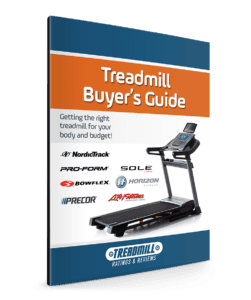 If you have read some of our other ProForm and NordicTrack treadmill reviews, you will find them repetitious because many of the components and features are similar. However, the overriding theme on most of these reviews is that fact that both brands offer you some of the best value for your money. The ProForm Pro 2000 is no exception when it is for sale at $1,399. For the price, you are getting some impressive components. In addition, you get a decent sound system, iFit Live compatibility, and the ability to decline the deck. It is all covered with a generous warranty. Our only suggestion is this – if you are a fanatical runner you will probably want to upgrade to a treadmill in the $2,000+ range. The ProForm Pro 9000 or the NordicTrack Commercial 2950 would be good ones to check out. That said, for your typical treadmill user the ProForm Pro 2000 is an excellent choice, and apparently a leading consumer magazine, whose name we cannot mention, agrees. Go to www.proform.com/treadmills to learn more.